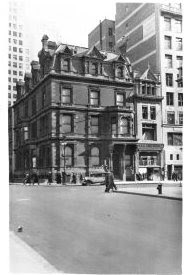 Robert and Ogden Goelet inherited vast real estate holdings in Manhattan upon the death of their father, also named Robert, and their bachelor uncle Peter. The family was descended from Peter Goelet, a wealthy New York merchant in the 18th century. Shortly after Robert married Henrietta (Harriet) Louise Warren in 1879, scandalously occurring the same year of his first wife’s death, he commissioned architect Edward H. Kendall to design a 5th Avenue mansion worthy of his social standing. The brothers admired Kendall’s work – within four years he had designed Ogden’s residence across the avenue at No. 608 and their 1884 Gorham Building at Broadway and 19th Street. Completed in 1880, the year the couple's son Robert Walton Goelet was born, it was a looming Queen Anne-style brownstone structure. Four stories tall over an English basement, it stretched far back along 48th Street. A projecting porch supported a deep second-story bay window on the Fifth Avenue side and a similar bay broke the severe lines of the 48th Street façade. The somber design became more relaxed at the fourth floor where a hipped mansard roof was punctuated by bold, dramatic dormers that marched along the cornice. The house was the setting of glittering social events. Four years after its completion, Henrietta gave “a little dance” here for 200 guests in honor of her sister, Edith. Among those passing among the potted palms in the hallways that evening were names like Lorillard, Astor, Belmont, Van Rensselaer and Schermerhorn. Harriet was fond of tapestries and antiques and collected them from around the globe. In the drawing room was a Vernis Martin harpsichord valued at $6,000 and she decorated rooms throughout the house with valuable XIV gilt furniture and French Empire pieces. In 1885 the Goelets had a daughter, Beatrice. 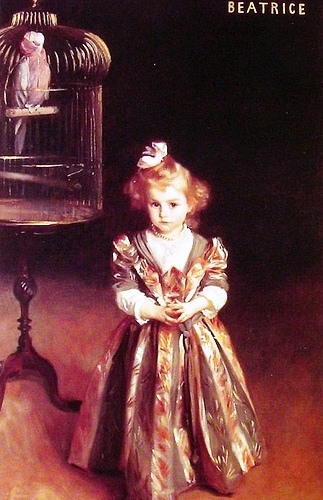 The sweet-faced girl would earn immortality when her parents commissioned society portrait artist John Singer Sargent to paint her with her pet parrot in the 5th Avenue home. Robert had a 306-foot steam yacht, the Nahma, built in Glasgow at a cost of $1 million. When the Goelets were not spending time at their Newport, Tuxedo or 5th Avenue homes, they were traveling abroad on the yacht. It was on such a voyage, in 1899, that Robert Goelet unexpectedly died of heart failure in Naples. Henrietta, who was along on the trip, was forced to endure the long crossing home with her husband’s body below deck. Goelet’s estate was then estimated at between $25 and $40 million. The young man’s fortune increased dramatically when, in 1902, his sister died. Beatrice, whom The New York Times said “had never been robust,” had accompanied her mother on the Nahma each winter since her father’s death, visiting Egypt, the Baltic and the Southern Seas. The yacht was preparing for their winter cruise when the 17-year old girl contracted measles which progressed into pneumonia. 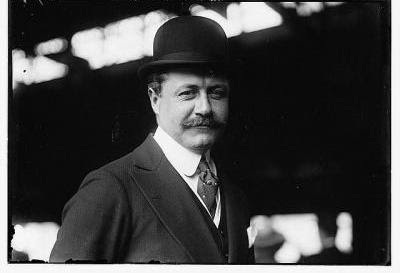 In 1911, The American Magazine did not estimate Goelet’s fortune so highly. In it Albert Jay Nock noted that ““Robert Goelet lives at 591 Fifth Avenue. His house is rated at $800,000 and his personal assessment in New York is only $6,000. A white elephant is a windfall beside such misfortune as this.” The American Magazine got it wrong. When Harriet was diagnosed with cancer in 1912, she took the Nahma to Paris seeking treatment in Paris. There, at her residence at 46 Avenue d’Iena, she died on December 4. Her entire estate of about $40 million was left to Robert. As the stress of wealth no doubt weighed upon Robert, he arranged massage sessions in his home with Dr. Robert E. Moore. Dr. Moore was considered one of the finest masseurs in the city and was often sought out by wealthy New Yorkers with stiff muscles. Goelet became concerned, however, when he noticed that about $3,000 in cash had disappeared over a period of months from his bedroom. Detectives left $350 in marked bills on Robert’s dresser on December 6, 1914. When Goelet excused himself from the room after his massage, the doctor helped himself to $90 of the unattended cash. Robert W. Goelet sought a new masseur and Dr. Moore sought a new profession. While Fifth Avenue changed, Robert Goelet stayed pat. As other mansions were torn down or converted into retail establishments or clubs, the wealthy financier and real estate titan lived on in No. 591. Then, on May 2, 1941, Robert Walton Goelet died of a heart attack in the grand brownstone mansion in which he was born. One of the last of the midtown 5th Avenue estates, it was now doomed. A three-day art auction was held in the house not long after Robert’s death. His mother’s tapestries, his father’s art, and the John Singer Sargent portrait of his sister Beatrice were sold. The house, for the first time in 61 years was empty and without a Goelet. Today there is no remnant of the house at No. 591. Like most of 5th Avenue’s grand mansions in the 40s and 50s, it has been replaced by a soaring glass and steel structure. And there's not a hint of a carved, stone griffin.